Nathan Abbott shares one of his favorite spots in Destin – Lucy Buffett’s LuLu’s Restaurant Destin. Lulu’s restaurant is located at the foot of the Mid-Bay Bridge in Destin, next to Legendary Marine (aka: The Whaling Wall). Kids can play in the large outdoor beach area with benches, play ground equipment and toys. While you eat and relax, there is a ton for them to play with and they are in a safe guarded spot. Have some “ME” time while your children think you are awesome. This family friendly restaurant boast over 20,000 square feet and provides 180 feet of bay front views. The large inside dining area seats about 350 people. Covered open air outdoor seating provides even more space for diners. Lulu’s Restaurant Destin also features the Crazy Sista Bay Bar, with a spectacular view of the sunset. LuLu’s Destin has ample parking and provides a convenient “Gumbo Train” to assist guests to and from the parking lots. They also host various events throughout the year and have live music nightly. Lulu’s Restaurant Destin is currently open 7 days a week, from 11 am to 10 pm. They have a special allergy menu that provides tasty items for six different types of allergies: gluten-free, egg-free, soy-free, seafood, shellfish, dairy. Lulu’s also serves a variety of margaritas, domestic and specialty beers, draf beer, Crazy Sista Honey Ale, Wine and specialy drinks. Lulu recently published a new cookbook, Lulu’s Kitchen, A Taste of the Gulf Coast Good Life. With 120 signature recipes from Lulu’s restaurants, this book allows you to taste the Gulf Coast goodness even when you’re back from vacation. Recipes include Southern delights like West Indies Salad, Perfect Fried Shrimp, Blackened Grouper Sandwich, Garlic Cheese Grits, Fried Green Tomatoes, and Heavenly Fried Crab Claws. And there’s a whole chapter on 25 specialty drinks, including “Bama Breeze” and “LuLu’s Painkiller.” There are also some personal stories tucked inside the book, for good reading. Growing up in Mobile Bay with brother Jimmy Buffett, Lucy “Lulu” opened her first restaurant, Lulu’s Sunset Grill, in 1999 in Fairhope, Alabama. After much success due to her fabulous cooking, Lulu’s re-located to Gulf Shores. Lulu’s in Gulf Shores serves approximately 4,000 people a day during the summer! 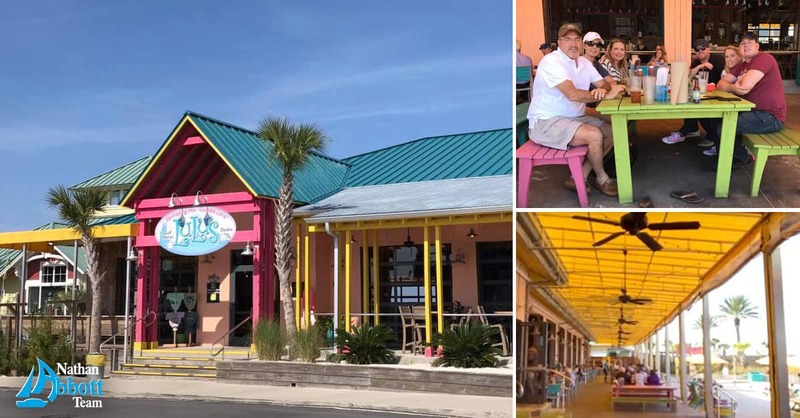 The restaurant also offers a ton of activities and entertainment like the Bama Breeze bar, Sunset Grill, Fountain of Youth splash pad, Mountain of Youth rope course, face painting, hair-wraps, volley ball nets, live music, retail store and a beach area. Lulu opened Lulu’s in Destin in June of 2015 and was received by locals and visitors with enthusiasm. Lulu’s has become a local hot spot and is sure to be one of the top restaurant/attractions in the area. Lulu’s Restaurant boats a great Destin location!